Christmas is just a few days away, but big toymakers may not have a lot to be merry about. Mattel's fourth quarter sales are expected to fall 6% from the same time period a year ago. The Barbie and Fisher-Price maker is struggling, despite bringing in a new tech-savvy CEO from Google (GOOGL) earlier this year. Mattel (MAT) shares have plunged nearly 45% in 2017. Hasbro's sales and profits should rise, thanks to the Disney Princess line of toys, Nerf, My Little Pony, Transformers and the Monopoly board game. But the stock has fallen 20% from its 52-week high after Hasbro (HAS) warned in October that fourth quarter earnings will be lower than expected, largely due to the recent bankruptcy of Toys "R" Us. The Toys "R" Us bankruptcy has led to fears of mass closings, although the retailer said earlier this week that none were planned just yet. This is hurting other toy makers too. The once mighty Lego announced a drop in sales and layoffs in September. And shares of toy company Jakks Pacific (JAKK) have lost more than half their value this year. 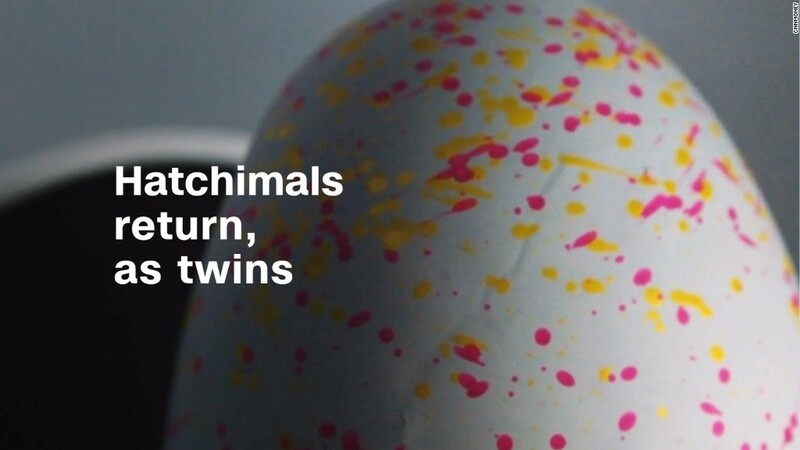 The only traditional toy maker really doing well is Canada's Spin Master, which owns the super popular line of Hatchimals toys. Spin Master's stock has surged more than 60% on the Toronto Stock Exchange this year. What's going on? Toy makers are always dependent on having new hits in addition to stalwart franchises. Hatchimals are clearly the craze of the moment. But the other big toy companies are finding it difficult to find something of their own to rival Hatchimals. The problems at Toys "R" Us clearly aren't helping. Hasbro, Mattel and Jakks Pacific each generated nearly 10% of their overall sales from Toys "R" Us in their most recent fiscal years. And while toy makers are all selling more on Amazon (AMZN) now, they often are doing so at lower prices. That doesn't help profits. A lackluster year at the box office might be hurting the entire toy industry, too. Big toy companies increasingly rely on hit Hollywood movies (particularly for kids) to drive sales of licensed toys. Hasbro has held up better than its competition thanks to the success of Disney (DIS) films, which also include the Pixar, Marvel and Lucasfilm studios. There are reports that the "Lego Ninjago Movie" that came out in September may not boost Lego sales that much. B. Riley FBR analyst Susan Anderson thinks the fears of soft Star War sales may be overdone though. She said in a recent report that her checks with retailers showed that Star Wars toys were selling well and that Hasbro could have a big 2018 thanks to the new Marvel movie "Avengers: Infinity War" and the Han Solo spin-off that will be out next summer. Anderson also likes Hasbro better than Mattel. She said it will take time for the strategy of new CEO Margo Georgiadis, which focuses on digital toys tied to "power brands" Barbie, Hot Wheels, Fisher-Price, Thomas & Friends and American Girl, to pan out. Still, the overall weakness in the industry has led to speculation that Hasbro might want to buy Mattel. Mattel shot down the talk last month, reportedly telling Hasbro that it wasn't interested and did not think a deal would pass antitrust scrutiny. Interestingly enough, Mattel tried to buy Hasbro in 1996, but Hasbro turned the offer down, citing concerns that the companies would have to sell several brands to get government approval. But not all toy companies are doing poorly. In addition to Spin Master, a private company called WowWee has a monster hit with its Fingerlings baby monkey toys. It also depends on what you define as a toy. Chris Rogers, research analyst with Panjiva, a big data firm that tracks global shipping of toys to the U.S., said spending on electronics has continued to rise -- often at the expense of old-fashioned toys. Children are increasingly shunning physical toys and board games and are playing more games on smartphones, tablets and consoles like the hot new Nintendo Switch. With that in mind, it should come as no surprise that shares of Nintendo (NTDOF) and game publishers EA (EA), Activision Blizzard (ATVI) and Take-Two (TTWO) have all soared this year. Kids still love to play. They're just not playing with the same toys that their parents did.